It's an obvious step - improve your concentration to improve your memory. To concentrate simply means to focusing intensely. If you aren't focused, you won't be able to memorize new facts or recall information you memorized previously. It can even lead to procrastination. Concentration is a mental skill you can develop. First, raise your brain's natural ability to concentrate. In other words, increase your attention. Second, adjust the environment around you to make concentrating easier. This can be especially helpful when actively studying for school, work, or leisure. To improve your concentration takes a little time and effort, but it can be worth it. In my experience you can make noticeable improvement in a relatively short time. 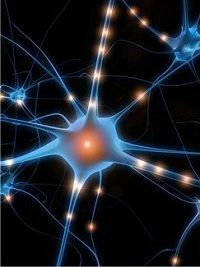 As books on neuroplasticity such as Train Your Mind, Change Your Brain explain, the structure and function of the adult brain is not set in stone as scientists have always said. When you learn a new skill, memorize information, or develop a new habit, the connections in your brain change. This is an exciting discovery. It's further evidence that your brain's abilities, including the ability to concentrate effectively, can be changed for the better. Research shows that these changes do not occur overnight, however. You have to work at it consistently and regularly. After all, you are literally reshaping your brain! So, where should you begin if you want to improve your concentration? Start building into your daily schedule habits that lead to increased brain power. Mindfulness meditation. Many studies confirm that 20 minutes of meditation or more per day improves concentration and attention span. Focusing on your breathing, known as mindfulness meditation, is one of the simplest way to meditate. Start with ten minutes in the morning and ten minutes before bed. By repeatedly bringing your attention back to the breath each time it wanders off, concentration builds and deepens, much as muscles develop by repetitively lifting weights. Proper sleep. Sorry to say it, but unless you are getting sufficient restful sleep, you are not going to be as mentally focused as you could be. See the Sleep & Memory page for tips and more information. Here's an idea: consider replacing your crummy old mattress. You know, the one that's so uncomfortable it makes you toss and turn all night? If you can't afford a new mattress, add a memory foam mattress topper over your current mattress. That's what I did recently. Peppermint Tea. Research suggests the scent of peppermint tea can boost alertness and mood. Drink a cup of peppermint tea for a quick pick-me-up. 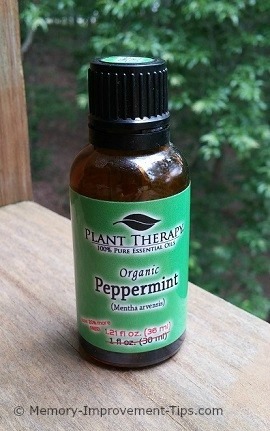 Or, dab a drop of peppermint essential oil on your skin. A diffuser can be used to spray the oil into your room air as a mist. Vitamins and other supplements. There are several brain enhancement supplements and other vitamins for memory that may improve your concentration. You might also want to take a look at Synaptol, a supplement for concentration sold by MicroNutra. Second, I recommend taking a mulitivitamin each day. That way, just in case your diet is not the greatest, you can perhaps avoid a vitamin deficiency that could hurt your brain. It also doesn't hurt to supplement with Vitamin C and fish oil capsules which are good for brain health. One important note - always consult your doctor if you have questions about your diet or any supplements you plan to take. Practice Clock Concentration. This is a concentration-training exercise anyone can do. All you need is a clock that has a second hand. Sit very still in front of an analog clock (a clock with hands). Without moving your body or looking away, watch the second hand travel around the clock face for five minutes. It's a lot harder than it sounds! Brain games. The more you use certain skills, the more they are reinforced in the brain, research shows. So it makes sense that playing concentration games and games that require you to focus will improve your concentration ability. My Brain Games page has over 200 free brain games you can play anytime. Again, though, you need to be consistent. Play for at least 10 minutes each day. Have fun, and get the benefits, too. Eat healthier. Your brain needs the proper nutrients to allow you to focus, and your blood sugar needs to be properly regulated (the brain consumes glucose, a sugar, as its primary fuel). See the Diet & Memory page for more about this. In addition to building the habits described above into your daily routine, also adjust your environment and your current mental state to improve your concentration when studying. Try the color red. To improve focus, look at red. A study by the University of British Columbia explains how color affects the brain. They discovered that red improves concentration and memory (while blue improves creativity). Researchers found that a small splash of color is all you need to benefit from the effect. 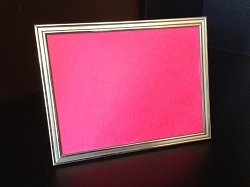 - Put red paper in a picture frame on your desk, as I've done. - Set small red items on your desk. - Add red to your outfit, such as a red shirt, red tie, or red scarf. - Change your computer's desktop background to red. You never realized your blue walls were wrecking your concentration, did you? Now you have a way to focus better whenever you want. Just bring out the red! Create a study spot. Your brain loves routine. Create a place where all you do is study. An obvious choice is a secluded desk of some kind, but the trick is to make sure you only study in that spot. Studying in bed is a bad habit, for example, because your body is trained to want to sleep once you get into bed. Try green light. Red not working? Try green. A different study showed that green light improves concentration. Install a green light bulb in the study lamp at your desk. If you think it makes a difference and helps you to concentrate better, let me know! Practice Your Listening Skills. Conversations are a great time to strengthen your powers of concentration. Focus on what the other person is saying. 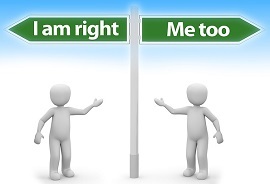 Work to understand their point of view. This builds your muscle of attention. Chew gum. Research shows that chewing gum while performing a task can improve your concentration on the task. Chew sugar-free gum only, though! Consuming pure sugar may cause your blood sugar to drop suddenly which would hurt your concentration. Take mental snapshots. Flex your concentration muscles by taking mental snapshots at important events. Focus intently on a special moment, then click your mental camera shutter by blinking your eyes slowly. Practicing this will improve your concentration and form a vivid memory of the event. Remove distractions. Turn off the ringer on your phone and take other steps to prevent interruptions. Don't study with the television on or with talk radio playing. Some studies have shown that instrumental music (no vocals) can help improve your concentration. Try listening to these music genres when you need to concentrate. Block background noises. If you have to study or work in an environment where it is too loud (classroom or open space) or too quiet (such as at home or at a library) you can get easily distracted by outside influences. With the right amount of background noise you can actually block out distractions and enhance your creative thinking. In these situations, play a "background noise generator" like the free Noisli (available via app or website). It blocks out annoying noises and/or fills up uncomfortable silences, which can help you focus and boost productivity. Use Time Boxes. Set a time limit when you need to study new material. For example, let's say you want to read one chapter in a book (and remember it). Decide in advance that you can have 45 minutes to read the chapter, and 15 minutes to review it. Set a timer to keep yourself honest, then pace yourself to keep within the alotted time. The use of Time Boxes can really improve your concentration by helping you stay intently focused on the material. Activate your Theta waves. Mental preparation is one step in the IMPACT memory technique developed in England. The brain is not always in a state of readiness to remember new material, but it turns out you can change this by deepening your breathing. When it's time to study or remember something new, switch your breathing to slower and deeper. Deep breathing actually changes the way your brain works by inducing the brain's electrical pulses to switch to Theta waves. 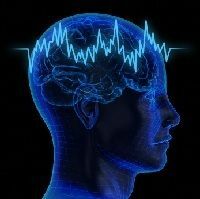 Theta waves normally occur during hypnogogic sleep. This is the stage of sleep when outside noises like an alarm clock can influence dreaming. It turns out being in this stage also can aid memory. A good example is the tip-of-the-tongue phenomenon, when information you've been trying to think of all day suddenly comes back to you after napping or waking up from sleep. To activate your Theta waves, switch your breathing to your lower abdomen. In other words, start breathing deeply from your stomach. Consciously slow your rate of breathing too. After a few moments, you should feel calmer, the Theta waves should be flowing in your brain, and you should be more receptive to concentrating on new information. To improve your concentration even more, combine intentional deep breathing with mindfulness meditation. Stay motivated with rewards. If you see studying as drudge work, it's hard to concentrate. One way to stay motivated is to set up a reward system. Tell yourself you have to earn that hour of watching your favorite show later in the evening by first completing one hour of intense studying. That way, even if the material is dry, you have the reward to look forward to. Take a break every two hours. Your mental energy will begin to decline after a long period of study. So every two hours or so, take a ten minute break. Walk around, eat a light snack, or just stare at the wall to relax your mind. Concentrating is the first step to learning anything new. It only makes sense that if you improve your concentration, your memory will improve also. 1. British Psychological Society (BPS). "Chewing gum helps you concentrate for longer, study suggests." ScienceDaily, 8 Mar. 2013. Web. 25 Apr. 2013. 2. Association for Psychological Science. "Meditation Helps Increase Attention Span." ScienceDaily, 16 Jul. 2010. Web. 17 Feb. 2013. 4. University of British Columbia. "Effect Of Colors: Blue Boosts Creativity, While Red Enhances Attention To Detail." ScienceDaily, 6 Feb. 2009. Web. 17 Feb. 2013. 5. Brandon Keim. "Seeing Red: Tweak Your Brain With Colors." Wired Magazine, 5 Feb. 2009. Web. 17 Feb. 2013. "Test subjects given attention-demanding tasks did best when primed with the color red."